In many ways today was quite unremarkable, which given the last couple was exactly what we needed. Caparrapí, being sat atop a huge ridge line, offered a fine 1200m descent to start of the day. Although the town was completely shrouded in cloud as we left, we soon dropped through it and never needed any layers. The road has relatively recently been sealed which made for a nice fun freewheel to test out our repaired freewheel. I was glad this worked as according to Strava's routing engine there was no way to connect through, as if the road didn't exist, but the last 2 day's routing was made entirely on the premise we could! (Google Street view plus some local knowledge had helped allay the worst of those fears). We started the day up there in those clouds! Once at the valley floor we were getting close to sea level, so the temperature rapidly rose to over 33C, and it was still only 9 in the morning! 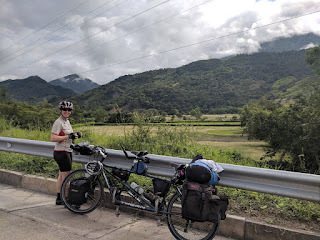 First we rejoined the Rio Negra, the same river we'd followed on Monday's epic decent through Pacho, but soon turned West from it to climb over to Rio Magdelana. This is the defining river of this valley, and of much of Colombia, running right through the country from the Andes in the South to the Caribbean sea to the North. Over it's history it had also carved a very wide flat flood plane, which was good news for us as it made for a couple hours of flat to slightly downhill constant paced riding. The wind was still but the pace was enough to create some cooling breeze to regulate our temperature so we made good time: in 50mins covering the same distance as we did all of of the previous day! Fairly regularly throughout the day we passed small towns or roadside communities with many tasty looking food and drinks establishments, but alas our bellies were not synchronized to these services so it was just a few "motorway service stops" for us, but randonneuring style they did the job. Powering our way along, in the ample sized shoulder of the dual carriage divided road, we had fun playing"guess the animal" for the road warning signs. Snakes, monkeys, anteaters, cyote, foxes all appeared on these signs but alas we didn't see any of those in the flesh. In the afternoon we left the river turning west towards the Andes foothills and, eventually, Medellin. This meant end of the fast rolling roads (for today, and probably for the rest of our trip!) and into climbing mode. The road reduced down to single lane non-divided road, and then the shoulder mostly disappeared, meaning a bit more testing riding among the traffic. The previous road was toll road and surprisingly quiet, but now we had some more bursty traffic to deal with. As the rolling climbs started the afternoon temperature was really rising, hitting 37C at one point. Eventually we made it to our chosen destination for the day, Rio Claro nature reserve. 130km riden was very pleasing progress after the snags of the previous day. On the plus side the nature reservation does look fascinating if here in the right conditions and lots of time to spare, with some really well organized activities from canopy walkways to swimming into caves etc to take on, in the sub-tropical rain forest. 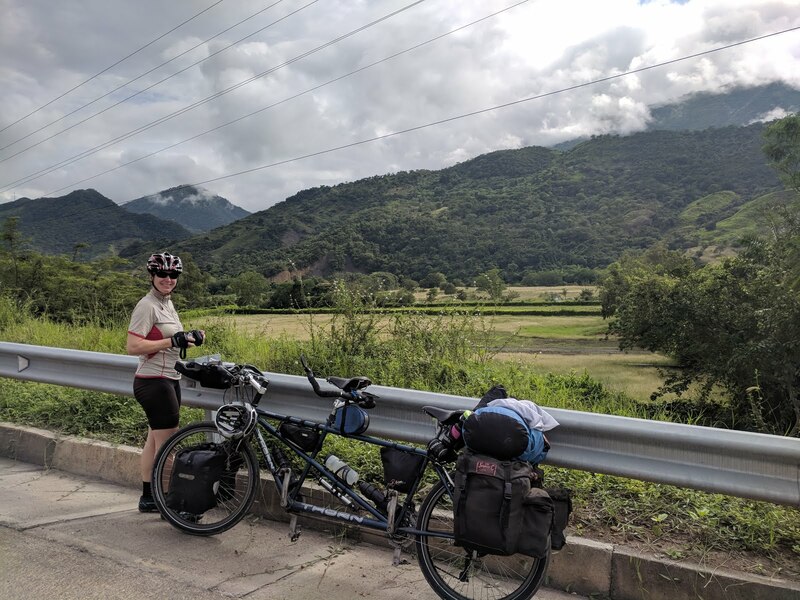 We debated putting tomorrow over to sight seeing here, but it would mean either starting riding in the hottest part of afternoon or staying in the bog another night and squashing our schedule of a day. Instead we'll probably aim for a good early start to get in some distance before it gets too hot. We have several days of solid climbing ahead, but thankfully that means decreasing temperatures again.